Hello ... Hello ... my old friends ... It's great to see you once again! Back in 2011, ELO Beatles Forever [ELOBF] recommended an album constructed primarily by Robin George - with a little help from his fifty or so friends including much missed founding Climax Blues Band and ELO Part II member Pete Haycock - entitled "LovePower and Peace" [Angel Air Records #SJPCD357]. The album was released with the prime goal of raising money for three well deserving charities in Compton Hospice, BCAT and Haven House. This impressive seventeen track collection of songs - also including contributions by Ruby Turner, Jaki Graham, Jon Camp [Roy Wood/Renaissance], John Wetton [Asia], Mel Collins [King Crimson], Pino Palladino [The Who] as well as many other established artistes - covers many different styles but is primarily a blues effort with a dash of rock and soul. The whole release pivots around a superlative eight minute plus rendition of The Beatles' "With A Little Help From My Friends" yet there are some great original compositions, vocals and collaborations throughout this 75 minute duration album. Robin told Yours Truly KJS recently that this was indeed the penultimate album to feature Pete Haycock with his excellent final Pete Haycock's Climax Blues Band album, tentatively named "Cruel", due for release later this year. 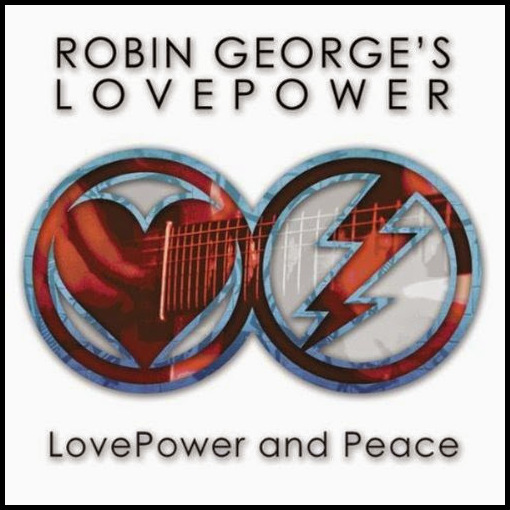 The guitar craft of the legendary rhythm and slide guitarist is more than evident within "LovePower and Peace". The trademark songwriting, guitar and vocals of George grab the attention with daughter Charlie adding her notable voice among those, for example, of Jacqui Williams, Sean Harris [Diamondhead], David Byron [Uriah Heep] and Pete Goalby [Trapeze]. 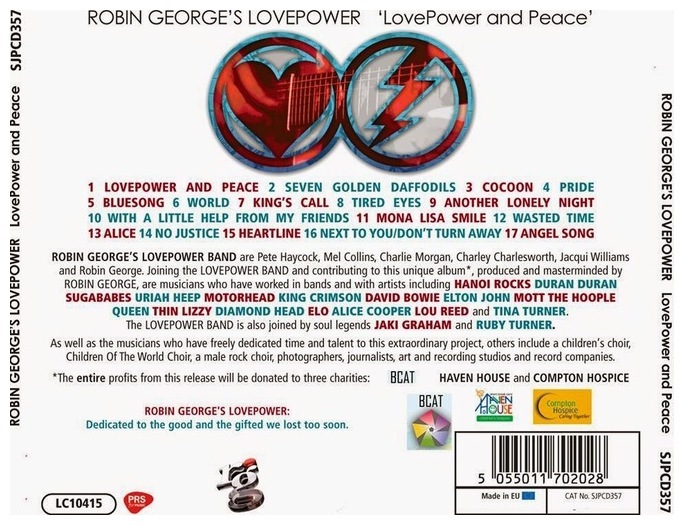 "LovePower and Peace" by Robin George's Lovepower can be ordered [in CD or download format] via the official Robin George web site, Angel Air Records and other reputable vendors including amazon.co.uk, iTunes and not a few others. ELO Beatles Forever [ELOBF] recommends "LovePower and Peace" by Robin George's Lovepower to those enlightened folks who enjoy the music of ELO, Jeff Lynne, Roy Wood, The Move, The Idle Race, 'Brum Beat', The Beatles and related artistes.